Posted on May 6, 2015	by Katy K.
Here’s another Cybils Young Adult Speculative Fiction Finalist, and a great choice for those who like their science fiction adventures with spaceships and strong-willed women. Salvage by Alexandra Duncan. Greenwillow Books, 2014. Ava Parastrata has grown up on a merchant trading spaceship. She knows with her dark hair, kept a dyed red to match her sisters, and her skin gray instead of transparent, she’s not likely to be a good candidate for anyone’s first wife. On her ships, girls are not allowed to read, sing or learn about technology – just to help with the children and livestock. When she’s told she’s to be married, she hopes that it will be to Luck, her best friend’s older brother, who is from a slightly less conservative ship where girls are allowed to read and do “fixes” on the ship. It all seems like a culture right out of Firefly, with folksy language and pioneer culture. But things go very wrong. Ava finds herself fleeing to the Earth her people have said will permanently corrupt her. Getting her body to work in full gravity will be just the first step. For the first time in her life, Ava will have to make her way based on her own skills rather than trying to fit into a role others have assigned. The journey takes several startling turns, from the floating trash island of the Gyre where Ava’s first rescuer lives, to the crowded slums outside of Mumbai. There are people to love and people to mourn as she makes and loses new friends, searching all the while for the aunt it was whispered she had somewhere on Earth, and for any sign of Luck, who must have been banished as she was. Assorted thoughts on the book: Ava has a large percentage of South Asian, making her a mixed-race protagonist – yay! She does look paler than I’d like on the cover, but the story makes it clear that her skin tone is considered horribly dark by her spaceship family, and darkens as she’s exposed to sunlight for the first time. She’s thrust into a full-color world, too, which I also appreciated. 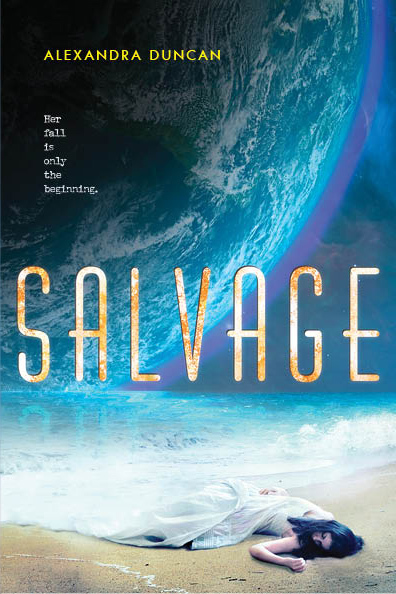 Sometimes (maybe even often), I get frustrated with books with love triangles – but Salvage (spoiler alert) contains a love triangle that really worked for me, both of Ava’s choices having just the right amount of appeal without the choice feeling artificially skewed one way or another. If this is an indictment of the way polygamy treats girls, marrying them off while still children to men their own father’s age, it’s equally an indictment of the way the system fails most of its boys, too, counted as extras in a system where only the most powerful men have wives. Like so many of the Cybils Young Adult Speculative Fiction books I’ve reviewed, this has a lot to talk about, while still having an exciting plot and, in this case, characters I really cared about and wanted to succeed. 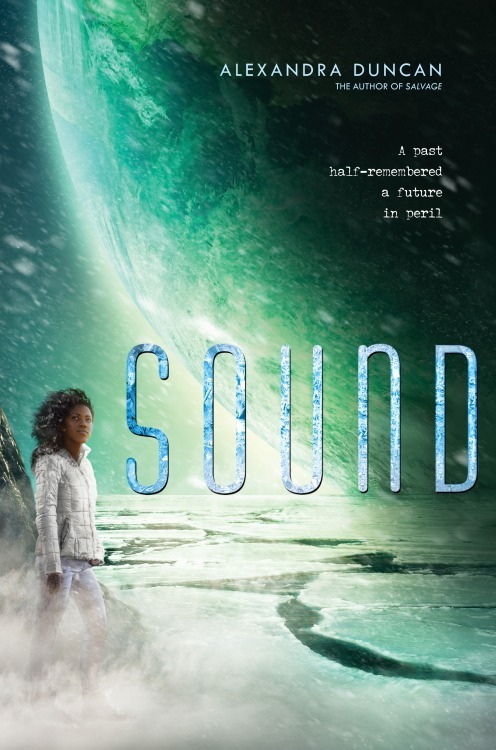 I was completely sucked into Ava’s story, and am very much looking forward to the stand-alone sequel, Sound, which is due out in September and tells the story of Ava’s adopted sister, Miyole. This is a good choice for fans of Marissa Meyer’s Lunar Chronicles, though what first popped into mind for a read-alike was Anne McCaffrey’s Crystal Singer series, with the caveat that I haven’t actually read these since high school. I meant to have this review up yesterday, but I got distracted on reading that Lerner books had bought many of the backlist and upcoming books from the now-defunct Egmont by trying to see if the last book in the Demon Catchers of Milan by Kat Beyer was one of them. Alas, no – neither the two books that are out nor the sequel, so I will still have to keep my fingers crossed and hope that the last book finds a new home. This entry was posted in Books and tagged award winners, Cybils, diversity, South Asian, teen science fiction. Bookmark the permalink.